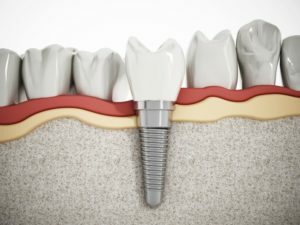 What to Do When Dental Implants in Dallas Are Failing? If dental procedures were a fairytale, dental implants in Dallas should be the prince charming that comes and saves the day. They work to replace lost teeth in the best way possible, by addressing both major parts of your lost teeth. Typically, the story would have a happy ending where the patient loves their smile every time they look in the mirror (and this typically is the case 95% or more of the time), but there are some sad endings to this story, like when patients experience implant failure. As you can imagine, it would be difficult to have to face another dental problem after already dealing with tooth loss. The let down alone would be enough to push a patient to believe that their smile isn’t worthy of repair. However, your dentist can actually help you restore a failed implant! Learn more about implant restoration here. How Do I Know My Dental Implant Is Failing? If Implants Are So Successful, Why Is Mine Failing? The rate of failure is extremely low for implants, but if you haven’t maintained good hygiene over the years, you could experience late-term implant failure. The common causes of failure are an infection known as peri-implantitis and bone loss. This infection forms around the implant and in the gum tissue. If you’re a smoker, the chemicals from tobacco products can infect the area. Or, if you haven’t cared for the implant site properly, infectious materials can build around it. Over time, it can lead to bone loss and other problems with your implant. Can My Dentist Help Me? If you are suffering from a failing implant, don’t ignore the signs. Getting help from your dentist is the best decision that you can make. First, your dentist must check the implant to find the cause of the problem. Sometimes, patients who think that they’re experiencing a failing implant can benefit from a deep cleaning from their local dentist. There are more serious cases that require extensive attention. If the tissues are infected, your dentist will need to clean the area and remove them. If the implant is damaged itself, then it can be replaced. The same goes for if your implant is having problems because of a damaged prosthetic. Your dentist will just make another custom one for you. Nothing is more frustrating or disappointing than having a dental implant failure. After all, your dentist is here to provide fairytale happy endings for your smile, with effective solutions that boost your oral health and confidence. In the case that you need assistance with your implant, don’t hesitate to reach out to your local dentist! Here at Kwon Dental, we’re here for you throughout every step of your oral health journey—even when your dental procedures don’t go as planned. Let us help you get your oral health back on track. Comments Off on What to Do When Dental Implants in Dallas Are Failing?